Hello my name is Jung. 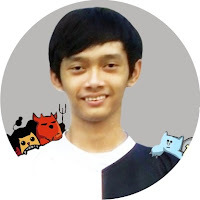 I'm a blogger and freelance graphic designer from Indonesia. Recently I have been working on my own projects at Katanium and as Junior Graphic Designer at Notif! Magz where I obsessed over layouts and typography. This helps me stay fresh in what I do and gives me new challenges to gain more experience. If you’d like to see some of my ideas brought to life, check out my Instagram or my blog post. When I'm not working with pixels, you'll find me in this blog.